This book came to me out of nowhere. I never ordered it and never intended to read it. But, I am glad I did that now. Though most of the people might not like with what this book has got to offer. It feels like you are reading a bollywood movie, where all izz well in the end. 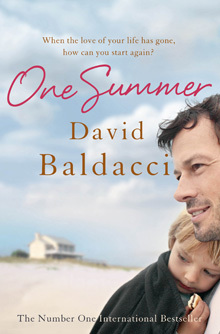 This was my first David Baldacci book who is known for his blockbuster thrillers. I think in future I am going to pick up one of his thrillers because I liked his writing. The story is about a man, Jack Armstrong, who is a war veteran and a happily married man. He is struggling with an unknown disease which doctors say is fatal and is gonna take his life away in a few months. Jack feels helpless and wants to make sure that before he dies, he must get closer to his three children and tell them how much he loves them. Lizzie, Jack's better half is a constant support for him and things fall when she dies in an accident. That's when Jack realises that how important it is for him to take the charge of his falling family and mend his relationship with his children and thats when the journey begins. I things that I couldn't comprehend that how Jack overcomes his disease miraculously and at times it felt like I am watching a Karan Johar movie, which has a tagline "It's all about loving your family". One thing is for sure that you would instantly feel connected to the emotions attached with the story and would not drop reading this one. The book becomes interesting towards the end and what I loved was Jack's letter given in the end of the book. A light read if you are traveling a long distance in a train or flight. Baldacci is a genius.. I have read quite a few of his books like Saving Faith and The Camel Club. He is extraordinary. I've another of his books on my shelf right now, waiting to be read. I’m always interested in how people react when am author writes in a genre they aren’t known for (Baldacci, Grisham, Paterson). Hit or miss.